How price segmentation works and why it's the key to maximizing revenues and profits at the same time. How to increase the effectiveness of your model by thinking outside the box about attributes and criteria. How to get beyond the conjecture and opinions to make your model an accurate reflection of the market. How to make your model as granular and specific as possible, while still being able to execute it in the field. This tutorial cuts through the apparent complexity of value-based pricing to provide simplified, step-by-step process for understanding and exposing the differential value of your offerings. 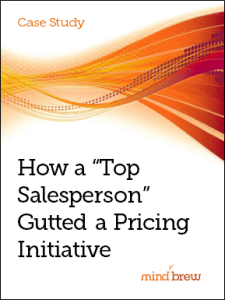 It's important to get Sales on-board when pursuing a pricing technology initiative, right? But how important is it, really? In this case study, learn to avoid the mistakes one company made when implementing a new pricing technology.